Are you in danger from new competition? Just some of the activities on offer. 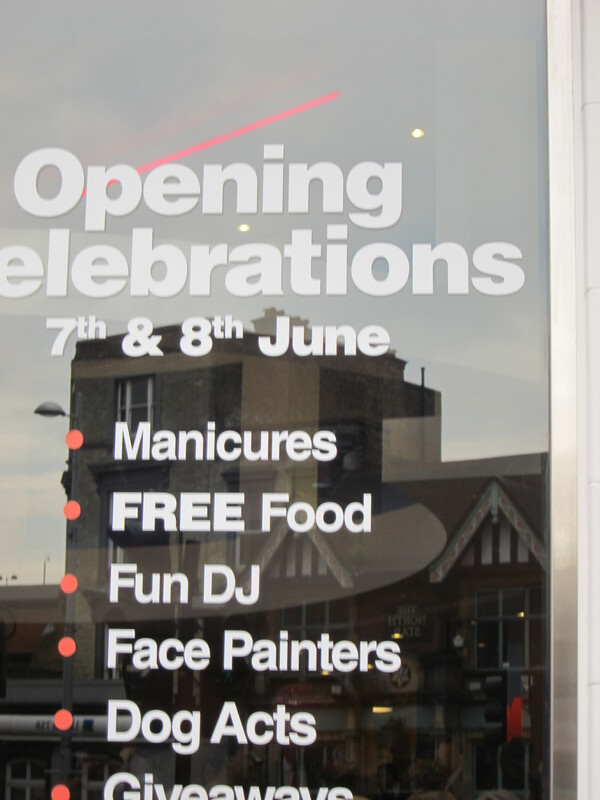 This weekend has seen the opening of a new bank in Ealing. ‘Big deal’ do I hear you say? Well I believe it could be. I’m not here to try and get you to sign up but I do want you to think about the threat of competition to your business. The opening was accompanied by great razzamataz and was getting plenty of attention. I popped in on Friday afternoon and it looked like quite a few people were signing up for accounts. Metro Bank is challenging the way banking is done in the UK. It is positioning itself as very customer friendly and innovative. The bank opens seven days a week from early until late making it easy for people to do their banking outside of working hours. It uses different language calling its branches as stores and the fit out is more open and informal that its competitors. I believe that Metro Bank presents a real threat to the traditional banks. 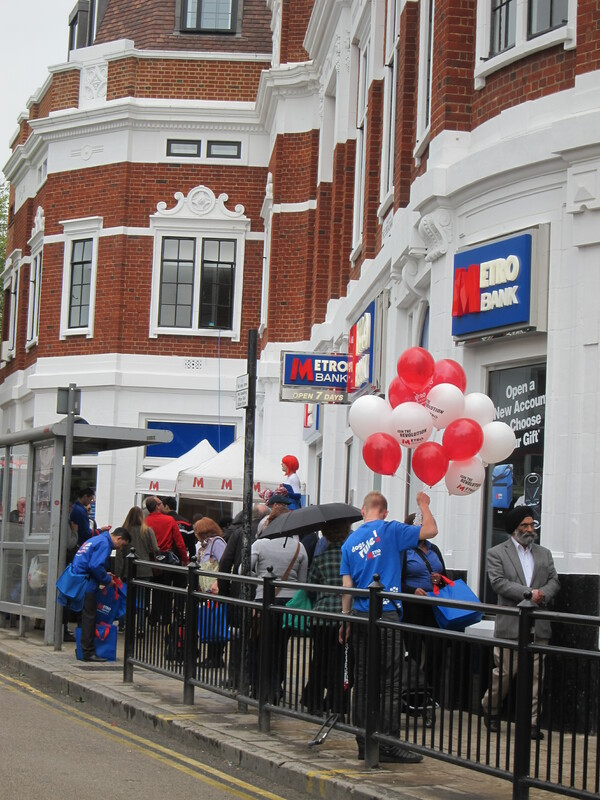 Metro Bank created quite a buzz on the streets of Ealing. So how have the big names responded? From what I can see they’ve done nothing! They don’t seem to have made any effort to remind their customers of all the benefits of staying with their existing bank. They haven’t adjusted their opening hours; when I tried to pop in to my bank at 3.20 on Saturday afternoon it was closed. Metro Bank was still open, giving away free gifts and encouraging people to pop in. I wonder how many customers the established banks have lost this weekend. I think that the big banks are being complacent. They have enjoyed years of exceptional customer loyalty, most of us never change our banks. But the position is changing. More people are now moving banks as the result of problems with their accounts. The Government now insists that banks must complete account transfers in seven days rather than the three weeks it used to take. With new players coming in to the market offering more customer friendly banking options we are likely to see unprecedented numbers of people switching accounts. The established banks will almost certainly have to change their business practices. What are the lessons for small businesses? We must understand the service that the new competition offers, is it a threat? How does our own offer measure up? When did you last conduct a competitor review? What steps do you take to make sure you are up to date with developments in your market place? Why not email me to see how we can help? New customers can book a free half hour, no obligation, telephone consultation here. Why not share your experiences in the comments section? This entry was posted in Business planning, Marketing, Small business advice and tagged Business, Competition, competitor research, Ealing, Metro Bank, positioning by glendashawley. Bookmark the permalink. Thank you Lisa. You show it can be done, always being aware of what is going on in your marketplace in spite of all the hours you work.